After weeks of testing on the Firefox Aurora channel, the next version of Firefox(Firefox 5.0) is already available in the Mozilla Firefox beta channel. Firefox 5 beta release includes the Firefox channel switcher, performance and stability enhancements and support for the new CSS Animations standard. Installing Firefox 5 beta in Ubuntu has not been easy, until now. How to Install or Upgrade to Firefox 5 Beta in Ubuntu 11.04 via PPA? Open Terminal and do the following. If you have removed the default Firefox from Ubuntu for some reason, you need to do the installation instead of the upgrade. Done. 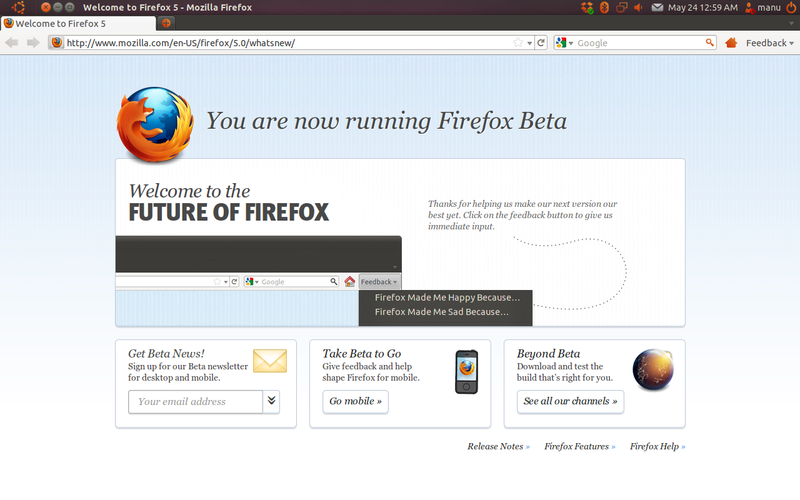 Firefox 5 Beta 2 is installed and ready to go. Big thanks to WebUpd8 for the upd8. "Firefox-Next PPA provides Firefox releases from the beta channel only, meaning you won't get highly unstable builds like the Mozilla Daily PPA. All new Firefox beta channel releases will be provided by this PPA, but with a delay because it takes some time to package new Firefox versions."